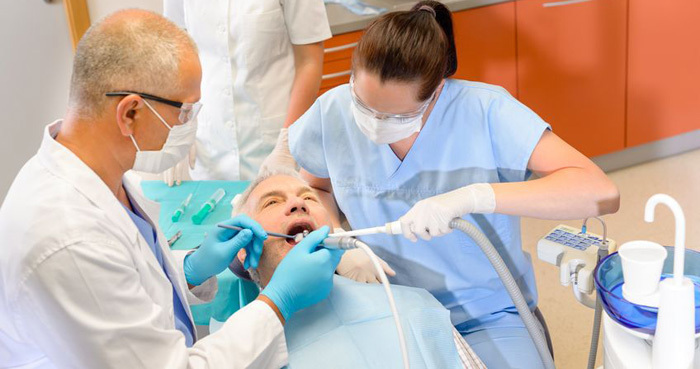 Is Tooth Extraction Advised If You Are Diabetic? Very simply put, a tooth has two parts. One which is visible is above the jawline is called the crown and the other part which is set in the jaw and visible is called the root. The crown and root in turn have many parts within and are responsible for various tasks they perform to help us eat and enjoy our food. Enamel is the hardest substance in the body is the protective outer layer on the crown, giving the tooth its white colour. Dentine is the sensitive substance the tooth is made of, and protected by enamel. Pulp is soft tissue which contains blood vessels and nerves that supply the blood to the tooth, from the crown to the end of the root. Cementum is harder tissue, that envelopes the root forming a solid base for the tooth to remain in place. Periodontal ligaments are fibres that connects Cementum to the bone socket around the tooth. While chewing these fibres absorb the shock of movement of the jaw bone. The moist tissue in the mouth which keeps the mouth wet is called oral mucosa. Gingiva or gums are soft tissues surrounding the tooth and the bone. Teeth are made to last a lifetime, provided we take good care of them. But due to various reasons, there arises a need to extract the tooth. The reasons for tooth extractions vary a great deal, the most common being tooth decay, and infection. Other common reasons are crooked teeth, poor alignment, gingivitis, and trauma. Tooth decay is caused by many factors one of which is a faulty life style, where starchy and sugary foods predominate among pre teens, and young adults. Lack of good oral hygiene is also responsible for tooth decay among other things. Diabetes is one of the most common life style diseases prevalent across all ages and classes. It is characterised by the body’s inability to use the blood sugar for energy. Pancreas is the organ in our body which produces insulin and releases it in the body, Insulin is the key which allows the cells in our body to uses it to process the blood sugar and convert it to energy. When pancreas does not release the insulin, the sugar level increases in the body and affect our internal organs adversely, sometimes resulting in death. We all have bacteria all around us, in hundreds and thousands. Our mouth is no exception. Bacteria grow in good growth conditions which can be provided by high blood sugar. If your blood has higher sugar levels than required, these bacteria will thrive in your mouth and multiply which will affect your gums adversely. They will slowly destroy all the tissues, and also the fibres connecting teeth to gums. Eating away on soft tissue make them inflamed, and results loosened teeth and periodontal disease. Diabetic people are more prone to develop decayed teeth and periodontal disease than other people, because high blood sugar level affects immune system, making it ineffective. 22% of people who have been diagnosed with gum diseases have diabetes. Increasing age with uncontrolled blood sugar levels pose more risk developing gum problems in older people. Serious gum problems in turn will cause blood sugar to rise and the circle repeats. The gum disease makes diabetes more difficult to control because the person is unable to fight the bacteria in the gums, making it difficult to bring down sugar levels in blood. Let’s come to the point of extracting a tooth when the patient is diabetic. Whenever an extraction has to be done, the doctor always asks for report whether the blood sugar level is within limit. The blood sugar level should be 13mmmol/L. If you have higher blood sugar level, the wound may take longer to heal. If the blood sugar is not controlled than there is a possibility of having cytokines, a harmful protein in the gingivitis tissue, blocking the growth proteins to heal the wound. High blood sugar also interferes with clotting of blood and making dental work difficult to heal faster. It is vital that before extraction you take proper medication to bring blood sugar to optimum level. After the extraction it is essential to keep blood glucose in control so that healing takes place. In diabetic patients if blood glucose is under control, gingival tissues will react normally after tooth extraction. Oral hygiene is critically important when tooth extraction is planned and executed because the mouth has to be prepared for tooth extraction. The healing process should take place immediately after the extraction so that no infection sets in. People with diabetes need to be careful because extractions open the gum to infection. This infection may cause hyperglycaemia and mobilize fatty acids leading to acidosis. All these conditions make control of blood sugar level extremely difficult. The major threat posed to diabetic patients with raised glucose levels for tooth extraction is not during actual extraction. The worry is how the healing will take place. The healing can be delayed, the socket may get dried and also a possibility of osteomyellitis. And if the diabetes is accompanied by hypertension, the result would be affected severely. Complications can arise after the extraction . The patient who is on oral tablets to control diabetes will need to be observed for two weeks on extended medications like antibiotics, analgesics, etc. and assessment has to be done again to make sure he is maintaining the ideal blood glucose level. If a tooth decayed and infected, immediate extraction has to be carried out, but in such a situation the presence of a physician during the operation is required. But all said and done, the diabetic people who are conscious of their blood glucose level and take proper care to keep it under control can safely go for tooth extraction after two weeks of medication. Then it may be like any other people having no diabetes.